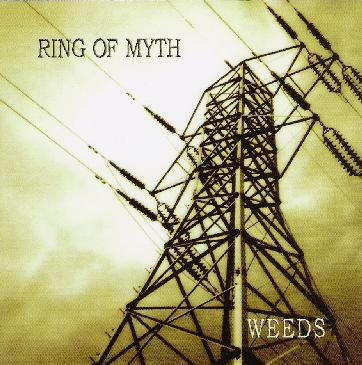 Ring Of Myth - "Weeds"
From Southern California, Ring Of Myth play a hard rocking brand of complex progressive rock. The band consists of Danny Flores on vocals, bass, keyboards and guitar, George Picado on guitars and Scott Rader on drums, keyboards and backing vocals. Their first CD, Unbound, was released in 1996 on the Kinesis label. The band start off hard and heavy with "Offering", which made me think of Yes as a more stripped down hard rock band. Ring Of Myth are more raw and in-yer-face, but no less manic and complex with the instrumental workouts and hairpin time signature turns. Sure, there are lighter floating passages, complete with Jon Anderson styled vocals, but if Yes are one of Ring Of Myth models, these guys definitely have taken it into a direction all their own. Being a fan of both progressive rock and down n dirty hard rock, I really dig the rough rocking edge and almost punk-like mania Ring Of Myth give to some pretty darn complex music. The 12 minute "Blue Stem" is another powerhouse track, chock full of dizzying instrumental segments and continually shifting themes as the music alternates between wild abandon and peaceful calm. Outstanding! "Drowning In Fire" and "Half Wing" are similarly breathtaking rides, though on these tracks Ring Of Myth inject a dark and heavy mid-70's King Crimson feel into the music. The 10 minute "Into Phase" is more blatantly Yes inspired. It's very good and has its rocking moments, but for the most part I have to say I preferred the runaway train style of the other tracks, where the band's influences are obvious but they establish some identity of their own. "Drone" is similar but with a nice guitar freakout section at the end. Though it's impossible to review this album without mentioning Yes, by the end it was clear that there's so much more that influences and shapes the Ring Of Myth sound, and the band had me hooked. It's excellent progressive rock that draws on classic prog and hard rock stylings. But for me, Ring Of Myth are at their best when playing hard and heavy, slamming the listener with a volcanic force that is simultaneously hard rocking and complex. Hot stuff. For more information you can visit the Ring Of Myth web site at: http://www.ringofmyth.com.